Viral Booth's Black and White Photo Booth is an elegant experience for your guests. Here's the glamorous black and white photo booth experience that's going to wow your guests. Everyone strikes a pose for the camera and the Viral Booth captures gorgeous black and white photos that your guests will be excited to take over and over again. Viral Booth offers dozens of photo layouts that our expert team will customize with your design, logos and text. Choose the classic 2x6 photo strip. Or, go big with the 4x6 postcard and even oversized 5x7 prints. No double prints in the Viral Booth! Our package includes unlimited prints that instantly shoot from the printer for your guests. As soon as photos are taken, guests get the chance to share them all over social media through Email, text, Facebook, Twitter, & Pinterest. Plus, we can upload them in the background to your Facebook page album so friends that couldn't make it can experience the celebration. Black and white photos look amazing on a snow white photo booth backdrop. Our over-sized 8 foot seamless fabric makes is fun and easy for big groups to fit in the photos together. Black and white photo booths are amazing with or without props. Share your event theme with us and we'll make recommendations on whether to go with props or prop-less. 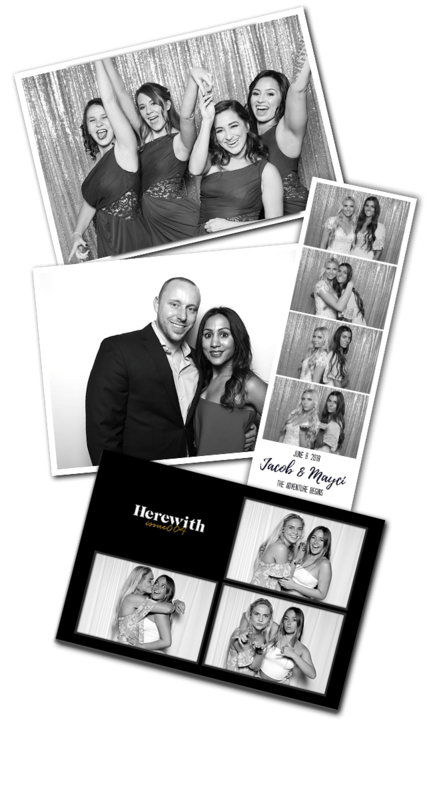 Every shot captured in the black and white photo booth is yours to keep forever. We'll email you a link to your online gallery of all images that you can download and share with family and friends.